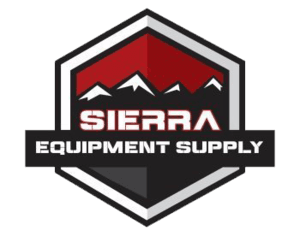 Welcome to Sierra Equipment Supply. Having owned and operated one of the largest private snow clearing companies in the US for over 35 years, and as a supplier of heavy equipment chain for the past 30 years, we see a lot of products come and go. We have been so impressed with a select few we knew we needed to share them with the industry. We have extensively tested all of the products we sell in our own business, and we stand confidently behind them. The MacLean municipal tractor is not only powerful for its size, it's built to last. MacLean has been an industry leader in mining equipment since the 1970's. Lightweight and durable, the MV4 is their newest state-of-the-art offering. It's used in hundred of industries with a wide variety of implements and attachments. A pneumatically powered chain rebuild tool. This bench stored fits onto a pallet 4 ft X 3ft. When required it is easily rolled into position, hooked to an air pressure source and unfolded to create a 8ft X 4ft work area at a counter top height. Chains have plenty of room to be laid out flat. Simply insert you "pretzel hook" into the spreading tool and apply pressure on a foot driven pedal and the spreading device will un-crimp the "pretzel hook to allow the operator to remove the cross link. Replace the crosslink, insert the open pretzel into the crimp side of the table and a second pedal applies the pressure to crimp the "pretzel hook" to the cross chain to lock in place. Maintaining a consistent spray pattern is critical for spraying sharp, crisp, accurate lines. Our Precision Spray Technology is the solution to all of the variables that you will undoubtedly run into on a job site. The articulating gun mount allows for a 360 degree adjustment in any direction and is designed for an easy one-time set up prior to spraying your first line. Since the gun mount is fastened directly to the axle, there is no opportunity for the gun to be spraying a line any closer or farther from the surface than the bottom of the wheel. This eliminates any opportunity four hour glassing in the pattern or splattering issues. Since 1981, MULTI SEAL has produced and sold tire sealant products for industrial vehicles and heavy trucks. MULTI SEAL's primary product line includes Heavy Duty, Heavy Duty Environmental Formula, Hydro Seal, Sports Formula, and Armor Seal. The product is installed through the valve stem and protects tires from underinflation caused by slow leaks or punctures. Armor Seal has been successfully tested on punctures in excess of 1.25" in heavy ply tires. The Ultramech Arctic Shark™ is the only mechanical roadway ice removal attachment for heavy equipment that increases overall productivity and reduces usage of de-icing chemicals. Built for durability, capability, and versatility, it can be mounted to a wide range of off-highway vehicles, including graders, skid steers, and utility type vehicles (UTVs) utilizing a universal attachment mount. The Arctic Shark is available in two model sizes and can be customized to multiple widths. Tire Chains for Farming, Forestry and the Construction Sectors 100% Made in the USA. Canadian Chains strives to manufacture and distribute the highest quality traction chains for the farming, forestry and construction sectors. All of our chains are made in the USA and we ship anywhere in the United States and Canada. Professionally delivering quality, proven products to the heavy equipment and construction industries.